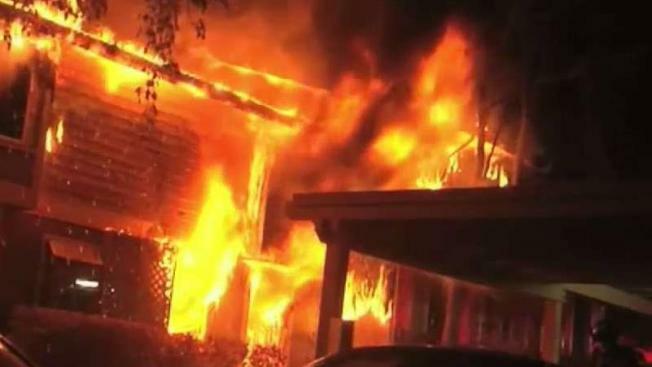 A one-alarm fire broke out early Monday morning at the same condominium complex in Martinez where a two-alarm blaze broke out Sunday morning, according to Contra Costa County Fire Protection District officials. Pete Suratos reports. A one-alarm fire broke out early Monday morning at the same condominium complex in Martinez where a two-alarm blaze broke out Sunday morning, according to Contra Costa County Fire Protection District officials. The blaze was reported at 1:25 a.m. today at 455 Eastgate Lane. Firefighters responded to the scene and had the blaze under control at 1:48 a.m., Fire Marshal Robert Marshall said. Marshall said the building was not occupied Monday morning and there were no reports of injuries. He also said that Monday morning's blaze was a rekindle of a fire that broke out at the same building Sunday morning. That two-alarm fire was reported at 4:15 a.m. and was caused by an unattended pot on a kitchen stove. Five of the 8 units in the building were uninhabitable as a result of the fire. One firefighter was injured in Sunday's blaze, according to fire spokeswoman Lisa Martinez. Details about the firefighter's injury or condition were not immediately available. Firefighters will remain on the scene this morning to make sure the blaze is completely out, Marshall said. Marshall said this morning's fire is not suspicious in nature and that rekindles happen occasionally.